King Robert the Bruce died on 7 June 1329. His body was buried in Dunfermline Abbey and his heart was taken on crusade by Sir James Douglas. Douglas got as far as Teba in Spain, where he was killed in battle with the Moors. The heart was returned for burial in Melrose Abbey. People have always been curious about the body and burial place of Scotland’s great hero- king. The choir of Dunfermline Abbey was demolished after the Reformation in 1560, and the tomb was lost. Excavations in 1818 revealed the skeleton of Bruce and fragments of the gilded marble tomb which Bruce had ordered from Paris before his death. 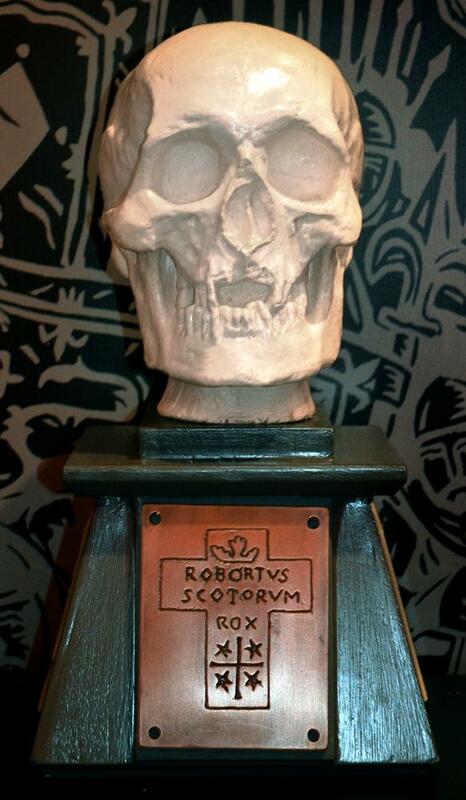 A cast was taken of the skull, a copy of which is displayed in the Stirling Smith, with a reproduction of the inscription, newly made by Stuart Fellowes of Longline Studio. The cast was used by Pilkington – Jackson to model the face for his Bannockburn statue in 1964. Royal Commission of Ancient and Historic Monuments of Scotland and Historic Scotland staff have worked together this year to recreate the tomb of Bruce for a special exhibition in the Hunterian Museum in Glasgow. Dr. David Mitchell of Stirling and Iain Fraser, RCAHMS, will be giving a talk on this exciting development next Wednesday at 12 noon in the Stirling Smith Art Gallery and Museum. Tel 01786 471 917 to book tickets.